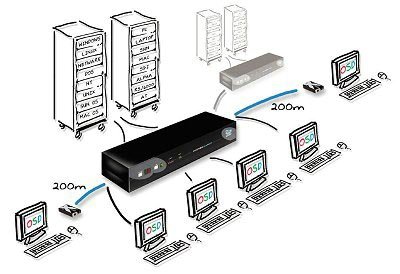 The Adder SmartView XPro SV2X8 is a KVM switch which allows switching for up to 2 users with integrated extenders for local and remote control. Multiple users can simultaneously control banks of computers from local or remote locations. This 8 port switch features 2 x simultaneous local keyboard, mouse and monitor ports and 1 RJ45 extender port to 8 CPUs. The SV2X8 is engineered for multiple users in server rooms and high density PC environments. The SmartView XPro with integrated extenders is engineered to allow users to control connected computers remotely from a clean environment. Adder's advanced on screen display system offers multiple user support, channel selection and password protection features. Note: Each of the RJ45 extender ports mirror a local port and requires an optional receiver unit to be purchased, see accessories.